Gravity is omnipresent. Our bodies, like all material structures, are required to interact with gravity at all times. Our structural health depends, in large part, on our ability to adapt to gravity. As upright beings, the demand of gravity is great due to our base of support being relatively small. To the degree that we organize our bodies to carry our weight as close to a central vertical axis as possible determines the level of strain present in our structures. When the body loses its architectural integrity, which can be due to poor posture, injury, illness, chronic stress, aging, restricted movement patterns, repetitive strain from activities such as computer work and sports, or acute emotional distress and trauma, fascia shortens and thickens in characteristic patterns of strain and tightness in order to shore us up against gravity‘s ever-present influence. We become somewhat constricted by this. We experience this battle with gravity as pain, stress, and depleted energy. Rolfers pay attention to structural discrepancies and imbalances that manifest patterns such as excessive spinal curvature, knock knees, bow legs, anterior or posterior pelvic tilts, pelvic rotations, rounded shoulders, forward head and neck, flat feet, uneven gait, chronically tight, rigid and restricted tissues with decreased circulation and a compressed spine and “core”. Physical characteristics such as these can produce strain in the structure accompanied by decreased circulation, neurological flow, economy of movement, and flexibility, and have the potential for manifesting chronic pain. Rolfing practitioners study body patterns through observing and palpating the client’s body. Assessment tools include observing the client walking and standing to assess their physical geometry and movement patterns, as well as palpation to determine the broad as well as specific strain patterns within the my fascia. Fascia is a vast network that gives the body its overall shape, and is a pliable medium that responds to heat and pressure. Through refined and intelligent pressure applied by the hands of the practitioner, with a general sense of where to work and in what order, fascia is softened and lengthened, allowing the body to rebalance itself along its center of gravity, whereby the major segments of the body (legs, pelvis, trunk, shoulder girdle, neck and head) are in a more supportive relationship. This manifests as visible changes in posture, alignment, and movement patterns, as well as increased volume and ease of breathing. When connective tissues are healthier and have appropriate levels of tone, certain physiological improvements are brought about. Fluids flow more easily, nerve impulses will be conducted more smoothly, thus creating a more effective motor response. Increased efficiency in the use of the muscles allows the body to better conserve energy. Breathing will be easier, and waste product removal will be more efficient. By better balancing the body in gravity, the body’s resting and active demands are lowered. Overall, one should find less random movement, as structural integrity is maintained and efficient motion is promoted. Changes occur to varying degrees with respect to a clients degree of deviation. 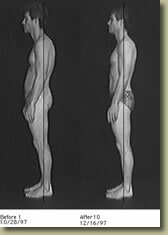 The overall results of Rolfing are often long term. 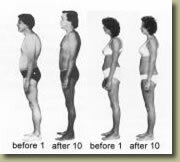 For more detailed information about how Rolfing benefits the body see "Rolfing Can Improve." This is one of the most common questions people ask regarding Rolfing. Although Rolfing is not pleasurable in the way that a Swedish massage would be, it does not in any way inflict pain on the body. However, the feeling of soft tissue compartments releasing can often be uncomfortable, and when working in areas of the body that are chronically tense or where the tissue is under chronic strain the work can be more intense. This is often as a result of metabolic wastes that are trapped in tissues which have poor circulation. Rolfing practitioners are trained to keep the session within a clients individual comfort level. The discomfort associated with some aspects of Rolfing work is more akin to an “outgoing” pain than and “incoming” pain, as it only lasts while the pressure is being applied, subsides immediately after pressure is released, and can be immediately relieving to areas that are chronically tight or painful. One of the most common expressions is that Rolfing “hurts so good.” For more information about Rolfing, visit www.rolf.org. Because Rolfing is a wholistic technique, it is recognized that changes in structure will impact the whole person, physically, emotionally, and energetically. Ultimately, it is the person's own experience of the work that is of primary importance. This plays a central role in the transformational aspect of Rolfing.